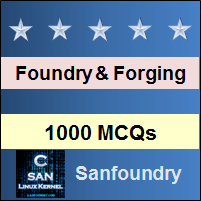 This set of Foundry Multiple Choice Questions & Answers (MCQs) focuses on “Properties of Moulding Sand”. Explanation: The fine grains are the sand particles which has a lower grain size. This lower grain sized particles always form a smooth surface over which the curves and edges can be dimensionally mapped. The fine particles allow less distortion of the metal and the surface obtained by them on the casting is smooth. 2. Which of the following is not used for the formation of the molding sand? Explanation: The coal is a material which is not used in the formation of the molding sand as the particle size of the coal is high and there are chances that it will react with the possible gases that are produced during the pouring of the metal and result in casting defects. 3. The size of the sand particles in the molding sand is the biggest. Explanation: The molding sand is made up of several particles. The properties such as porosity, texture are all considered while making it fit for the use of the foundry. Out of all the materials used, the size of the sand particles (silica sand) is the highest. 4. The _______ is responsible for the impact strength in the molding sand. Explanation: In a foundry, the molding sand forms an important part of the cope and drag. It should have high impact strength, stability and permeability and this is imparted by silica sand in the form of granular quarts which has enough refractoriness to cast all of these strengths to the molding sand. 5. Molding sand can withstand chemical reactions on it and prove it to be beneficial for the casting formation. Explanation: Molding sand is added with chemicals to enhance properties such as permeability, Compressive strength etc., however, the chemical reactions happening is not viable for the formation of the casting as it might cause explosion or severe fatal effects in the casting. 6. The _______________ property ensures the removal of excess sand in the mould box. Explanation: The adhesiveness is a property of molding sand to get the stick or adhere to foreign material such as sticking of molding sand with an inner wall of the molding box. Hence, as the sand sticks to the box and the excess sand is removed. 7. Binding property of the sand increases because of the ____________ property. Explanation: The cohesiveness is a property of molding sand by virtue which the sand grain particles interact and attract each other within the molding sand. Hence, the binding capability of the molding sand gets enhances to increase the green, dry and hot strength property of molding and core sand. 8. Which of the following is the most important property of the molding sand in cores? Explanation: After the molten metal in the mould gets solidified, the sand mould must be collapsible so that free contraction of the metal occurs and this would naturally avoid the tearing or cracking of the contracting metal. In absence of collapsibility property, the contraction of the metal is hindered by the mold and thus results in tears and cracks in the casting. This property is highly required in cores. 9. The adhesiveness and cohesiveness are the same properties of the molding sand. Explanation: The adhesive property refers to the sticking of the sand particles to each other so that they can take up the desired shape. But, cohesiveness refers to the property where the particles react and interact with each other and attract to increase the strength. Hence, the terms are different. 10. Flow ability increases with increase in the green strength. Explanation: Flowability or plasticity is the ability of the sand to get compacted and behave like a fluid. It will flow uniformly to all portions of a pattern when rammed and distribute the ramming pressure evenly all around in all directions. Generally, sand particles resist moving around corners or projections. In general, flowability increases with a decrease in green strength and vice versa.